ORANGE, CALIFORNIA (AP) -- A flight student from Egypt is facing deportation from the United States after being investigated by federal agents for posting on his Facebook page that he was willing to kill Donald Trump and the world would thank him. Elsayed, who is being held in a jail in Orange, California, is devastated at seeing his dreams of becoming a pilot dashed over what Bushra acknowledged was a foolish social media post. An immigration court hearing will determine whether Elsayed will be deported. "It seems like the government was not able to get a criminal charge to stick on him, so they used the immigration process to have him leave the country," Bushra said. "The rhetoric is particularly high in this election, and I just feel he got caught up in the middle." Trump is leading the Republican presidential contenders and has used especially tough talk on immigration to win over many voters. He has vowed to build a wall along the entire Mexican border and has called for temporarily banning Muslims from entering the country. 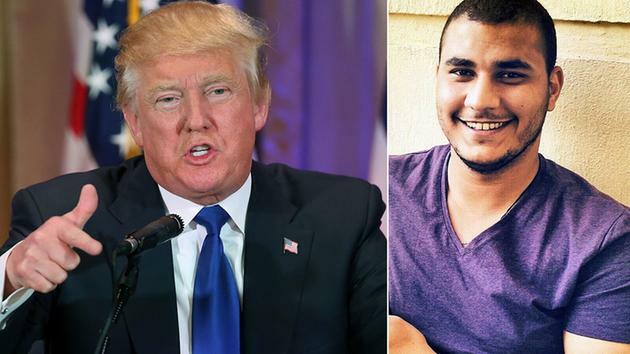 Elsayed said he wrote the message because he was angered by Trump's comments about Muslims. He said he immediately regretted it, and he never intended to harm anyone. "It's just a stupid post. You can find thousands of these every hour on Facebook and the media," he told The Associated Press in a phone interview from jail. "I don't know why would they think I am a threat to the national security of the United States just because of a stupid post." Elsayed said the agent who interviewed him mentioned last year's shooting rampage by a Muslim husband-and-wife couple in San Bernardino and the Sept. 11, 2001, terror attacks, which were carried out by Muslims who had sought flight training in the United States. The State Department and Secret Service declined to discuss the case. A Trump campaign spokeswoman also declined to comment. Elsayed is from Cairo, but he said he spent much of his life in Saudi Arabia, where his father worked as a civil engineer. He came to the United States for the first time last September to attend Universal Air Academy with the hope of returning to Egypt and getting a job at an airline, he said. He said he'd like to continue his studies in the United States if the government lets him stay. If not, he will seek a refund of some of the $65,000 he has spent on his education and use it to study elsewhere. Alex Khatib, owner of Universal Air Academy, said he knows little about the case except that federal agents showed up at his school to interview and later detain Elsayed. Officials asked him to terminate paperwork he had issued so Elsayed could study for his pilot's license, he said. Khatib said he would take him back if the government allows. "He is honestly a good student," Khatib said. "He seemed to be a good guy."